Eevee is one of the cutest and adorable Pokemon that have ever been created. Eevee and all of his evolutions have been on a list of my daughters for me to make since Pokemon Go came out. I made Jolteon and Flareon a while back but neglected the others. This is the pattern that I came up with for Eevee by adapting my Jolteon pattern. 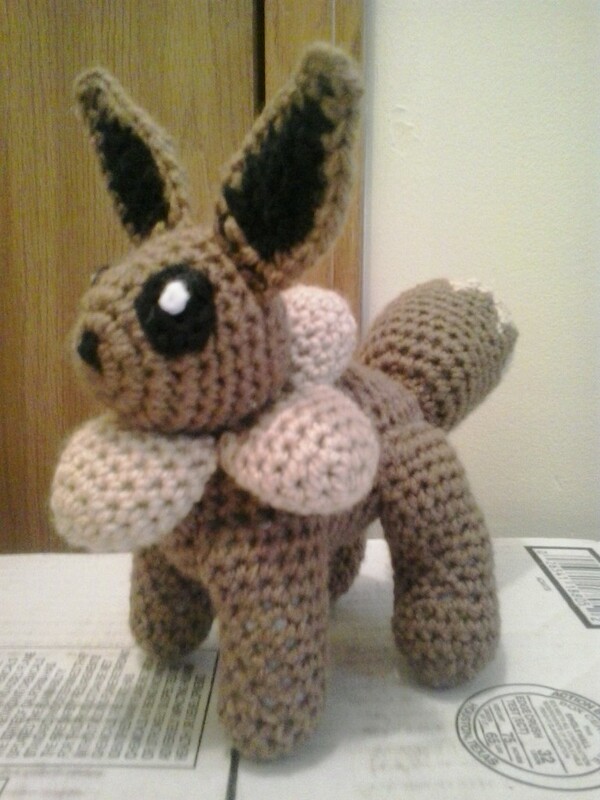 This pattern includes the color lists for both Eevee and Shiny Eevee. Finish off. Weave in ends. Stuff NECK FUR FRONT lightly. Finish off in first 2 pieces. DO NOT FINIDH OFF in third piece. Stuff NECK FUR SIDES AND BACK lightly. Finish off leaving a long tail. Sew NECK FUR to BODY. Eevee, Shiny Eevee, Jolteon, Flareon, and Pokemon are copyright Nintendo and their respective creators.